Because it's always fun to compare other products with your own just to find out how good or bad you are at something. Also, it makes it easier for you guys to get a better understanding of what business tasks we can solve (and what we can't). What are social intranets and how they differ? The three products we're about to analyze are social intranet with main purpose to serve small and medium sized companies improve their internal and external communications. They offer a wide range of communication and collaboration tools that can be used by companies with different profiles and business needs. "Yammer brings the power of social networking to your company". Indeed, Yammer presents itself as a communication platform for businesses. It can speak many languages thus it can help you involve people from many countries (they will be pleased to work in a GUI with their mother tongue, indeed). Collaboration tools are limited to standard file sharing, groups, polls, and comments. "Work with any group of people inside a workspace and your entire company in your Employee Network". This service is advanced in terms of collaboration instruments and the number of add-ons offered on the free App Market. Podio can be defined as a communication environment enhanced with collaboration tools which can solve business tasks of an uncommon/specific nature (custom apps). "Transparent collaboration and communication platform for your company". Apart from extended project management tools and CRM, Bitrix24 allows you to use classical intranet instruments (shared files, contacts, company structure and hierarchy) with social network features (activity stream, instant messages, likes, etc.). This platform seems to incorporate all possible communication models used by businesses nowadays. They can be vertical (CEO or Department chiefs have extended rights and options), horizontal (everyone can communicate at any levels), formal (assigning tasks, scheduling meetings, delivering reports) and informal (likes, comments, open Workgroups). A great addition to the Cloud version is Bitrix24 Self-hosted version that you can migrate to anytime you want! What You Get for Free and What You Get for a Fee? Some apps and programs are 100% free, but some have limitations in the free version. The limitations can be the time of usage (e.g. one month free) or the number of features available in the product (e.g. you can enjoy using 15 features out of 25 that exist in a product). There are also mixed freemium models that can limit both the time and the number of tools. A great number of apps and web application that use the freemium distribution model very often advertise additional features inside their services (pop-ups, tooltips, offerings on pages) and via newsletters to their free users. Some of the additional commercial features may be critical for your business growth, and some of them may help workflow go smoother or give you more control options. The question is: how badly you need those additional features, and if you do - how much you are willing to pay for them? Here is the compare table that I've prepared for you. It lists Yammer, Podio and Bitrix24 user and storage policy (especially for free subscriptions), and it also shows what the maximum set of tools and features you can expect from each service. But is this enough to make a final decision about what product you'd want to invite your colleagues to? I think we need some more details. In the free plan, you have 1 Gb online storage at your disposal, but you have unlimited storage on Podio if you're a Premium user. The maximum size is 100 Mb per file. You can upload and share files from your Google Docs/Drive, Dropbox, SkyDrive or ShareFile services. You can attach files (all kinds) to a conversation in the Activity Stream, to your comments, and to projects. In Podio you can organize files into libraries in Projects. Yammer allows you to use the same amount of online storage for your files as Podio does - 1Gb for free companies (with the file max limit set to 100Mb). There's a File Directory in Yammer wh ere you can see a list of all the files you can access. You can also follow a file to get notifications if changes have been made or new version has become available. Bitrix24 allows free users to upload and manage up to 5Gb of documents and images. If you opt for a commercial subscription, you can get 50 Gb, 100 Gb, or more (the online storage limit is actually not set). Unlike in Yammer or Podio, Bitrix24 allows you to organize files just like you organize them on your PC or Mac. You can create folders and subfolders (which can be shared or have restricted access), and create photo galleries. Direct editing of documents is also supported for MS Office files. You can create up to 5 user accounts for your intranet and invite up to 5 users into your extranet for free. That's the limit for companies using the free subscription option in Podio. No admin roles are available, i.e. everyone is equal. Access permission are managed element-wise: each document, conversation or task can be associated with certain number of people from the Intranet, Extranet, or both. Yammer allows you to create an unlim ited number of intranet users at no cost. However, you can invite people with the same corporate email (i.e. @yourcompany.com - no @gmails or @yahoos allowed). If you switch to a commercial plan (which is $5 per user per month), your company will also get up to 100 external users that you can invite into your network. If you want to have more than 100 Extranet users, you'll need to pay additionally. For admin options in your Yammer network you'll need to switch to a commercial plan (no admin settings in the free subscription plan at all). You can have as many as 12 user accounts in your free Bitrix24. If you work in Bitrix24 with a free subscription, you cannot invite people from outside (create Extranet users). When switching to any commercial plan ($99 or $199 per month), you'll get an unlim ited user accounts for both the Intranet and the Extranet (which I personally find totally cool - and no wonder, I am a Bitrix employee, remember?). The admin role is carried out by the person who created your Bitrix24 network. The admin in Bitrix24 can change the basic network settings, including access permission, and manage subscription plans. No customization options and no white labeling available for Podio users at the moment. All Podio users work in their networks using the same color schemes and interfaces. You can attach a logo or a picture to your workspace, but that's pretty much everything you can change in Podio. Just like in Podio, you have very lim ited design customization options in Bitrix24. For example, you can’t put your logo in the main upper panel, nor can you change color schemes; you can only enter the company name for your Bitrix24 Intranet. Nonetheless, if you run your intranet in a Bitrix24 Self-hosted version you can customize your intranet however you like (the self-hosted version is supplied with full source code and access to back-end, including the system templates). Yammer is more flexible in term of design: you can add a logo, and premium users can change the way the whole upper main panel (masthead) looks by adding a background image and text. Different colors can also be set in Yammer, which is quite convenient for Intranet users since they can easily recognize in which network they are currently working and communicating. I really hope you found this information interesting, and thanks a lot for reading it through! As you saw, there is a lot of free stuff that you can get from all three products. So go ahead, explore, experiment, and decide what product looks prettier and feels right just for you! 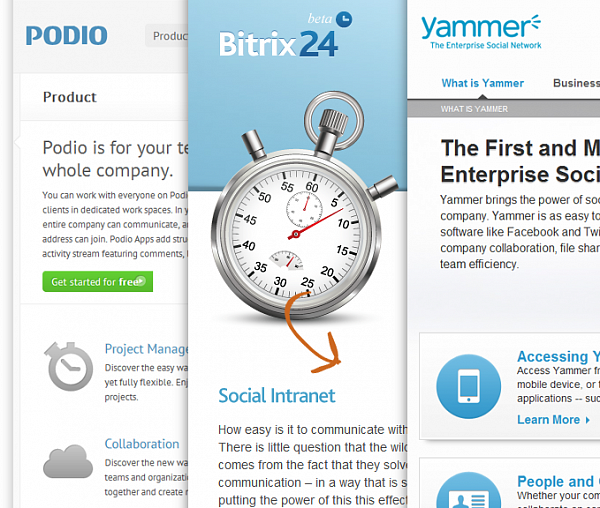 All the paid stuff which is the part of the freemium model can seem a bit perplexing: Bitrix24, Yammer and Podio offer different commercial tools and features. Your choice will largely depend on what business tasks you want to solve. As a proud and loyal Bitrix employee, I'll be happy to see you among the Bitrix24 users (and maybe commercial customers). But if you decide for Yammer or Podio, it'll be great, too! Just like us, those guys are working their asses off to offer you outstanding social intranets for free!